This is a story I first told at Celtic Crossing in Memphis, Tennessee, on St. Patrick's Day, 2014. The Irish violently resisted English conquest, but each effort to resist ended in defeat. Each defeat led to the confiscation of lands of rebellious clans, which led to further rebellions and each, being Irish defeats, led to further confiscations. The Irish pushed off historic clan land, and the land was sold by England to English land speculators. The land was often given to creditors of England to reduce national debt, or given to English soldiers who went unpaid for years of Irish wars. After few centuries of this, Ireland was owned by relatively small number of English, and Irish were tenants of their own land. The English referred to these lands as "plantations" - not because they were planting crops, but because planned to plant people on these lands. The English were doing the same thing at the same time in North America - establishing plantations in Virginia, the Carolinas, Georgia, and elsewhere. Most English settlers wanted no part of these plantations in Ireland. Those English inclined to leave England, jumped across Atlantic and moved to North America. These plantations were attractive, though, to the Scots. There was widespread poverty in Scotland. Scottish farms were often small and unproductive. Scottish tenant farmers were being evicted, with the landlords substituting sheep for the evicted tenants. Many Scots moved to Ireland and became tenants in these plantation farms. Others moved to Ireland and became merchants in the towns growing in Ireland. Even more moved directly to North America - either to the United States or Canada. 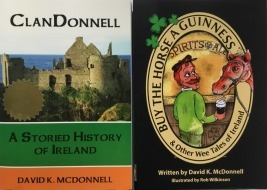 I will tell you about two Scottish families who moved to Ireland. These are the Hutchison and Jackson families, both of which lived for many generations in the Scottish Lowlands. Scottish families were Catholic until the late 16th and early 17th Centuries, as were most inhabitants of the British Isles. But during the Reformation movement, most Scots in Lowlands became Presbyterian Protestants. The Hutchisons and the Jacksons were not exceptions - they became Presbyterians.